A twenty-minute drive away from the busy hub of I-40 and the noise of the road, the work day of a farrier begins unceremoniously. A trailer full of equipment is backed into a horse barn, equipment is unloaded, and work is immediately undertaken. Father-son duo Donnie and Chris Taylor begin their day beneath the hum of rain on the barn’s tin roof with intensity, focus, and a careful and determined pace that could only be settled into after years of practicing their craft. 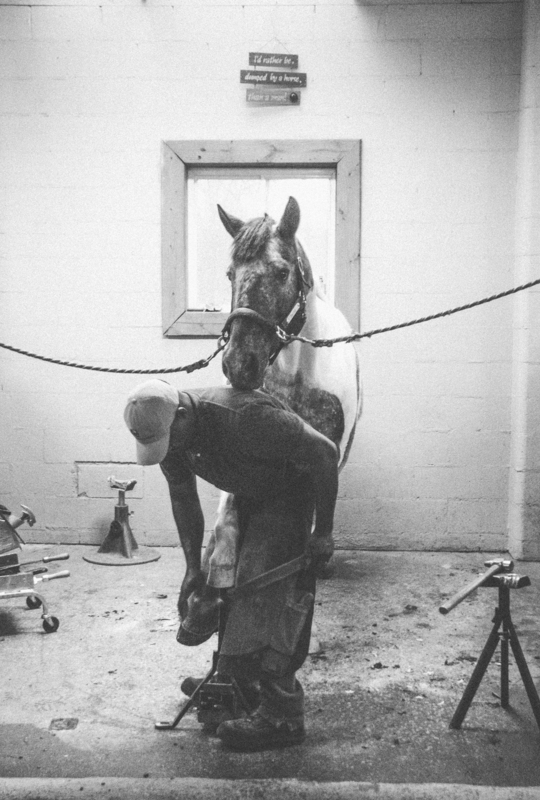 A farrier is “a craftsman who trims and shoes horses’ hooves.” They work in the realm of what is more commonly known as a blacksmith, conjuring up images of glowing iron and the drama of tradition. They practice a craft that runs far back in history and is rich in heritage, Chris being the third generation in the field of work. The role of a craftsman is not quickly understood in a culture where many of our jobs are performed in cubicles and at computers. “Craftsmanship means dwelling on a task for a long time and going deeply into it, because you want to get it right,” Matthew B. Crawford wrote in his book Shop Class As Soul Craft. The farrier’s craft sounds simple enough: putting a shoe on a horse. However, his job is one that requires a prerequisite knowledge and strength. To begin with, there are a wide variety of horses and shoes that he must know about. Getting the shoe right is a tedious job that requires much strength and focus, along with knowledge of breed and anatomy. Inside the horse’s stall, a cart full of nails and files and tools is prepared beside the horse, much like the equipment spread out beside a dentist’s chair or a surgeon’s table. Chris begins by straddling one foot of the horse and prying the old shoe away. He is poised with hundreds of pounds of animal against him, his legs protected by an apron against any movement that might send a nail through his jeans. Shoeing the horse is a small medical procedure, Donnie tells me, because the horse’s foot is an extension of his bone. They quickly explain the process to me: take the shoe off, remove the nails that secure it, trim the foot down, make sure the shoe is completely balanced and level, place the shoe in the forge so it can be hammered and molded to fit the horse, drive in the nails into the new shoes, finish off the foot and make sure it looks pristine. While shoeing the horse is the task to be completed, satisfying the customer is the ultimate goal. “The horses have different personalities, and the people have different personalities,” Donnie explains. To build his business, Donnie decided to build a positive reputation in a field known for having difficult personas. He dedicates himself to showing up on time and doing the job right. It’s this dedication that makes it no surprise Donnie has been shoeing horses for thirty years, beginning in Louisville, in the line of his great-grandfather. After a few years of apprenticeship, he returned home to West Tennessee begin his own practice. For the last nine years, his son has joined him in their work in Jackson. Chris was not immediate in his decision to join the family trade but is now dedicated to the family business. Of all the jobs he has had, Chris says this is the hardest, but the reward outweighs it all. He describes the end result as a small blessing, when all that physical work results in a horse ready to perform for their owner. This is what brings joy to the craftsman: a job performed intensely and carefully and met with a deep sense of satisfaction.